Atlantic City becomes presidential campaign prop, but will it matter? Hillary Clinton rallied against opponent Donald Trump's business record during a rally outside the shuttered Trump Plaza Hotel & Casino on Wednesday, July 6, 2016. 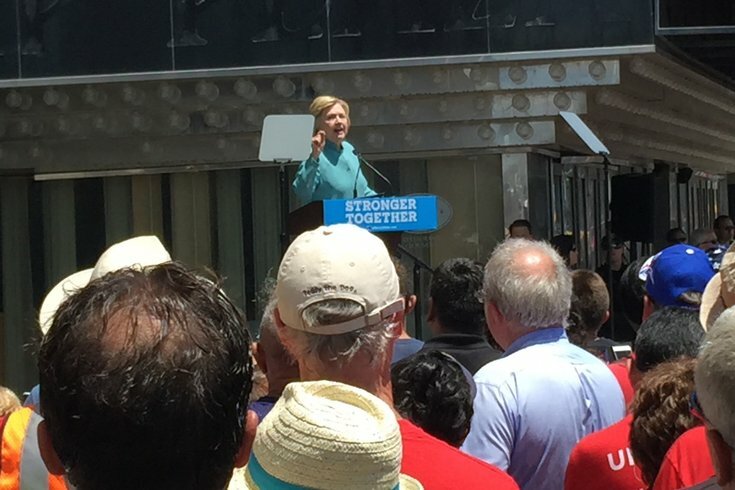 As stages for political gamesmanship go, a podium atop a platform on the Boardwalk outside the shuttered Trump Plaza Hotel & Casino served Hillary Clinton’s message just fine on a sweltering Wednesday afternoon. When you’re trying to damage your presidential opponent’s professional reputation, what better place to attempt to do that than outside a property for which he sought bankruptcy protection back in the day, right? Tapping into a recent string of stories that paint her opponent Donald Trump as a businessman who personally cashed in while driving up debt and stiffing contractors, Clinton made the case that the damage he wrought on Atlantic City would carry over to the whole country if he were elected president. She also singled out New Jersey Gov. Chris Christie, possible Trump running mate, as someone to blame for Atlantic City’s ills. “The people of Atlantic City are determined to turn things around,” she said. “If your governor will start doing his job instead of following Donald Trump around, holding his coat, maybe we could really get New Jersey's economy moving again." In the crowd of a few hundred people were dozens of UNITE-HERE Local 54 union members who took a break from picketing a mile down the Boardwalk at Trump Taj Mahal Casino Resort. Among that group was Pete Battaglini, who said his support of Clinton did not merely represent a way to get back at the man who once owned the casino where he works. “She is for labor and working people,” Battaglini said, noting that Trump has damaged working families through his casino-based business practices in Atlantic City. From the stage a few minutes later, Clinton said Battaglini and other union members should be supported in their efforts. She later made a quick stop at the Taj’s Pacific Avenue entrance to meet striking workers. Trump’s record at the Taj also factored into her introduction at the rally. Clinton stood with Marty Rosenberg – a contractor who’s been quoted in several news stories talking about how Trump allegedly stiffed him on a $1.1 million bill for installing “floor-to-ceiling curtain walls of glass” at the Taj. He openly worried that Trump’s “manipulation of people” would damage America’s standing in the world should he become president. As far as political theater goes, it was the right time and the right place for Clinton to forcefully inject Trump’s Atlantic City legacy into the presidential race. Still, in a remarkably unorthodox campaign without a playbook, who knows how widely fashioning Atlantic City as a political prop will resonate. It makes sense on paper, but the presidency isn’t won on paper alone. 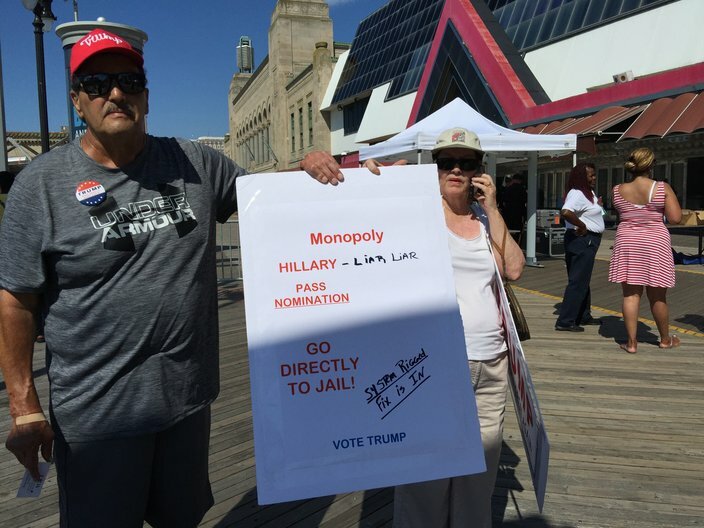 Dominic and Jean Leonetti voiced their support for Donald Trump outside the Hillary Clinton rally on the Atlantic City Boardwalk on Wednesday, July 6, 2016. 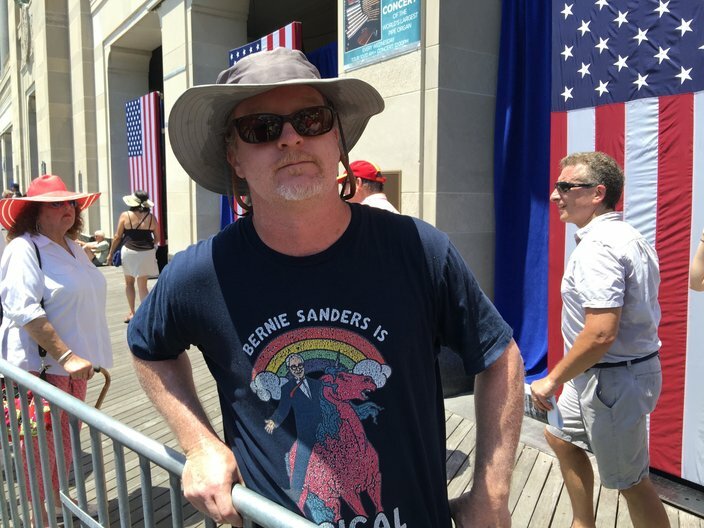 More than two hours before Clinton took the stage, Dominic Leonetti and his wife Jean established their opposition outpost not far from the secured public entrance along the Boardwalk. They held signs chiding Clinton for her email scandal, citing Trump’s “the system is rigged” talking point, and placing blame at her feet for four deaths in Benghazi, Libya. Dominic Leonetti – who claimed roots in Brooklyn, South Philadelphia, Atlantic City’s Ducktown neighborhood and now offshore in Atlantic County – was asked whether he was worried about being outnumbered by Hillary supporters waiting in a long line to pass through security. Clinton didn’t come to town to win over Trump supporters, though. The way this race has shaped up, that’s a virtual impossibility (on both sides). But with polls tightening, she’d be well served listening to Mike McGlone’s message. But he was quicker to point out that he was disappointed with what he’d just heard before Clinton left the stage and shook hands with supporters as Rachel Platten’s “Fight Song” blasted through the sound system. McGlone, a Northeast Philadelphia native who moved to Oregon but plans to return to his hometown for the Democratic National Convention later this month, said he needed to be convinced to vote for Clinton. Mike McGlone went to Hillary Clinton's rally to hear a reason to vote for her. He was disappointed that all he heard was 'Trump bashing' instead. My takeaway from Hillary Clinton’s Atlantic City appearance? If it cements the resort as a steady talking point throughout the next four months, Wednesday could be seen as a turning point that widens the narrowing poll margins. If Trump can't wield business success as a talking point, what else does he have? But it could just as soon be forgotten about tomorrow, much like the resort town itself, though city officials are putting up a fight. Trump's assertion that he thrived while the rest of the resort floundered may cancel out Clinton's claim that the exact opposite happened. After all, if this campaign season has taught us anything, it’s that all bets are off when it comes to conventional wisdom about political races meaning much these days.